Go to the freezer section of your grocery store and you'll find a million flavors of Ben & Jerry's (except grape or Sugar Plum) and Häagen-Dazs. 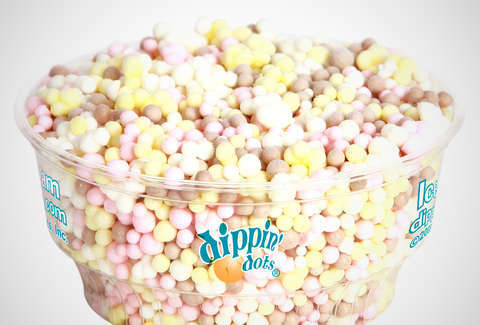 But you'll never find the futuristic ice cream Dippin' Dots in the freezers, a fact uncovered by a sleuthy Reddit user. According to Dippin' Dots, most grocery stores (and the freezer you have in your kitchen) don't get cold enough to hold the unique ice cream's shape. Your freezer is probably around 0 degrees Fahrenheit, but the Dots are flash frozen (as in, frozen super quickly) and stored at negative 40 degrees Fahrenheit. Fun fact for you nerds out there, that's the same temperature as negative 40 Celsius! Now, you could still eat the Dots at 0 degrees, but they would all stick together. Another Redditor who sold the ice cream at a tourist spot said that if a freezer lost power, the Dots would have to be thrown away within 30 minutes! By then those Dots would cease to be, you know, actual Dots, and that isn't a dessert anyone should want to be a part of. That's why the company has installed special freezers in convenience stores around the country packed full o' Dots. Back in 2013, the Dippin' Dots company decided people might want to eat its ice cream at places other than baseball games or amusement parks, so it began shipping freezers. If you're too lazy to go to a convenience store (despite it being quite convenient), you can get 'em delivered to your house packed with a ton of dry ice. Thirty cups of Dots will run you a cool $59.95 (including $9.99 shipping). And while a dessert stored at -40 degrees seems like something of the future, it was actually created in 1988 by a microbiologist. If that whet your appetite, we've got plenty more tidbits on the tiny, tasty dessert. Lee Breslouer is a senior writer for Thrillist, and needs a Dot. Follow him to ice cream @LeeBreslouer.